Twitter was abuzz ( well, at least a-twitter) this week with the news that an abandoned ship, possibly filled with rats, which were possibly eating each other, was possibly going to run aground in the near future. The ship, the Lyubov Orlova, was seized by Canadian authorities in 2010 and broke free of its mooring in a storm last year. The so-called “Rat Ghost Ship” has not been spotted in many months, and the speculation that storms may have driven it in the direction of Ireland or the UK seems … speculative. Nevertheless, imagining a ghost ship full of cannibalistic rats is ghoulish fun, so we’ll extend it one more day with our first-ever Science Raturday. 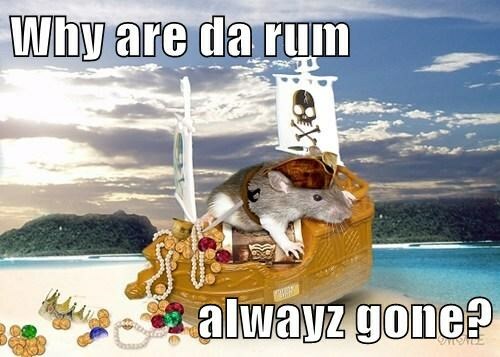 This entry was posted in Science Caturday and tagged Cannibal rat ship, Ghost Ship, lolrat, Pirate Rat. Bookmark the permalink.